Carolina Reserve Meadows in Indian Land, SC is an active lifestyle community by Lennar Homes that offers homebuyers an attractive option for affordable superior suburban living in South Carolina. Carolina Reserve is a master-planned community home to two defined neighborhoods of two-story and ranch homes. Started in 2012, Carolina Reserve also includes over 70 acres of open space among its total of 404 homesites. 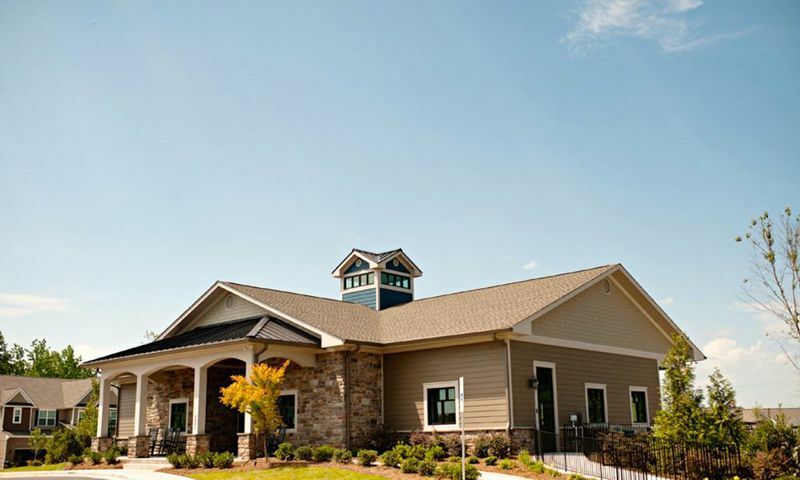 Carolina Reserve Meadows homeowners enjoy access to a recently built clubhouse. This 6,000 square-foot amenity center is open to all residents of the master-planned community Carolina Reserve. Opened in 2014, Carolina Reserve Meadows' elegantly styled clubhouse has a large multi-purpose room filled with tables and a lounge area ideal for playing cards, crafting, or hosting parties. There is also a meeting room equipped with a conference table and catering kitchen, perfect for hosting a meeting or forming a club based on common interests. Residents never have to travel far or pay expensive membership fees to work out because the clubhouse includes an exercise room complete with bathroom facilities. Carolina Reserve Meadows' thoughtful amenities continue outdoors with a sparkling pool, outdoor patio, playground and splash area, as well as miles of scenic walking and biking trails. Carolina Reserve is divided into two neighborhoods, The Meadows' 239 homesites and The Enclave's 165 homesites. Carolina Reserve Meadows's homes, with their ranch-style floor plans, are perfect for active lifestyle homebuyers looking for low-maintenance living. The array of floor plans in The Meadows are designed by Lennar Homes and offer between 1,686 and 2,776 square feet of living space. There are eight models from which to choose that have two to four bedrooms, two to four bathrooms, and an attached two-car garage. These ranch homes are ideal for homebuyers who lead a busy lifestyle, and some include two-story plans with plenty of space for residents who like to accommodate friends and relatives who want to come visit. Features may include staggered kitchen cabinets with crown molding, stainless steel appliances, ceramic tile back splash, granite counter tops and recessed can lighting. Flooring materials include ceramic tile in the laundry rooms and bathrooms; and hardwood in the kitchens, foyers, dining rooms, breakfast areas and powder rooms. Homebuyers who want to be closer to family will enjoy the affordable and relaxed lifestyle at Carolina Reserve Meadows in Indian Land. Despite the tremendous value, buyers need not sacrifice on amenities. The community clubhouse is the center of the social scene at Carolina Reserve. Residents use the facility to host barbeques, attend luncheons, and participate in potlucks. Themed parties are always planned throughout the year, these include costume contests, St. Patrick's Day celebrations, and holiday parties. Carolina Reserve Meadows in Indian Land is located in a suburban area within minutes of the desirable Ballantyne shops, restaurants, business offices and entertainment venues. Other major shopping opportunities of interest in the area include Stonecrest, Blakeney and Pineville Mall. Nature lovers will enjoy the community's proximity to the Catawba River where they can engage in recreational pursuits year round. Other recreational opportunities include several golf courses in the area. For day trips, major entertainment and shopping, Charleston, Columbia, Greenville and Hilton Head are popular options. Carolina Reserve Meadows is wonderful community planned by Lennar in a great location with resort-style amenities. There are plenty of activities available in Carolina Reserve Meadows. Here is a sample of some of the clubs, activities and classes offered here. Carolina Reserve Meadows will contain 239 single-family homes upon completion. Homebuyers can find a new or resale residence that has between 1,686 and 2,776 square feet of living space. These homes are ideal for homebuyers who prefer first-floor master suites and low-maintenance exteriors. 55places.com is not affiliated with the developer(s) or homeowners association of Carolina Reserve Meadows. The information you submit is distributed to a 55places.com Partner Agent, who is a licensed real estate agent. The information regarding Carolina Reserve Meadows has not been verified or approved by the developer or homeowners association. Please verify all information prior to purchasing. 55places.com is not responsible for any errors regarding the information displayed on this website.